This recipe has also been featured in the Washington Post, in Sarah Kaplan’s wonderful article on our project. Like the fantastic Desart Cakes, these Potingall Cakes caught my eye because of their intriguing name and relatively simple ingredient list. Unlike the Desart Cakes, which are what we would call cookies, these are little cakes. And pretty tasty ones at that. This recipe comes from the first volume of UPenn Ms. Codex 631, dated 1730. (This two-volume collection has become one of our favorites.) “Potingall” is probably a stand-in for “Portugal,” since the recipe closely resembles the fairly common recipe for “Portugal cakes” found in many seventeenth- through nineteenth-century cookbooks. Getting “Potingall” from “Portugal” doesn’t seem unreasonable: the two words are visually similar, and the writer copying the recipe into Ms. Codex 631 could have been working from another recipe that was difficult to read or itself mistaken. (Like an eighteenth-century game of telephone!) “Portugal” named a type of orange in the period and might refer to the recipe’s use of orange flower water. However, Portugal cakes’ name more probably relates to one of their ingredients: sack, a sweet, fortified white wine originally produced in Portugal. In a stand mixer or with a hand mixer****, cream the butter and flower water until light and fluffy. With the mixer running at low speed, blend half of the flour mixture into the butter mixture; scrape down the bowl. Add the eggs and sherry, then mix at low-medium speed until combined; scrape down the bowl again. With the mixer at low speed, add the rest of the flour mixture; mix until the batter looks uniform. Add the currants and mix at low speed until they are distributed evenly. Bake until cakes are firm to the touch at the center and golden brown around the edges. (A toothpick inserted into a cake should come out clean.) This will take around 12-14 mins. for mini-cupcakes, 14-16 mins. for madeleines, and 18 mins. for cupcakes. Let cool in pans for 3-5 mins., then remove onto cooling racks. *Note on flower water: I tried these with both rosewater and orange flower water; I preferred the rosewater version because the flavor was subtler, but both flavorings played nicely with the currants. **Note on sherry: I replaced sack (a sweet, fortified white wine) with the similar and more readily-available sherry. If you prefer a non-alcoholic cake, orange juice or white grape juice (or water) would most likely be a fine substitute. Raisins could also substitute for currants in a pinch. ***Note on pans: This recipe works best as small cakes: cupcakes, mini-cupcakes, or madeleines, for example. Use whatever combination of pans you’d like. The recipe yields approx. 18-32 cakes: 12 large madeleines (filled with 3 tbsp. batter each) + 6 cupcakes / 12 small madeleines (filled with 2 tbsp. batter each) + 10 cupcakes / 24 mini-cupcakes + 8 cupcakes. ****Note on mixing: In the spirit of updating this recipe to modern kitchens, I used a stand mixer rather than blending the dough by hand. However, the original method would also work – and be satisfyingly messy. These are not light and fluffy cakes. They’re moist and dense, like a weightier muffin, with a rich flavor from the flower water, sherry, and currants. I liked them best as madeleines because that shape provides the highest edge-per-bite ratio – the crisply browned edges are particularly tasty. 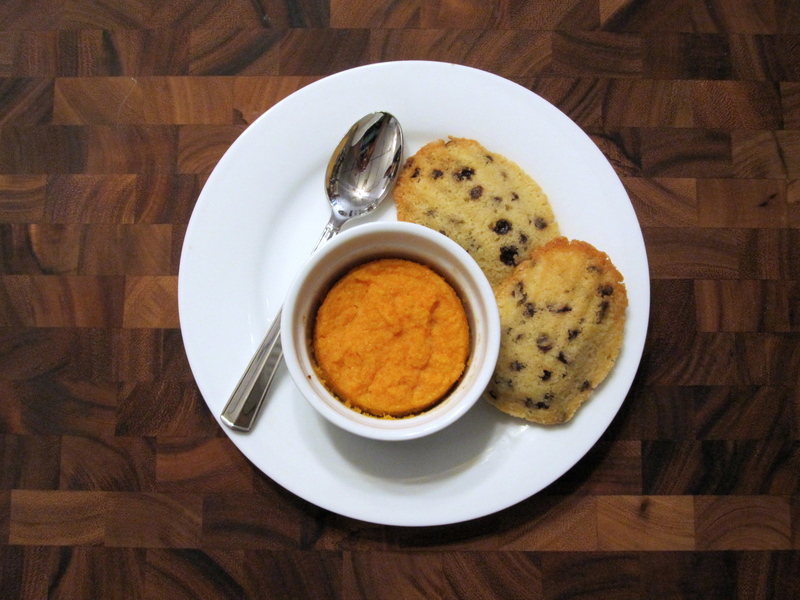 They also made an excellent snack alongside our old favorite, carrot pudding. Potingall is not a misreading a Portugal, but a rather standard development, through loss of r, from Portingal, a name for Portugal deriving from Latin portingalensis. Sara, thanks for this – I had one of those moments where I just knew that “Potingall” meant “Portugal” but couldn’t put my finger on why, and I didn’t make the “Portingal” connection. I’ll edit the post accordingly. The mixing of butter and flower water by hand, as in the recipe, may not be about mixing and air entrainment, but the “alchemy” of heating the butter and slowly incorporating the water. Should I try this recipe I might experiment with both methods. By the way, whenever I make shortbread, I use my hands. It makes for a more tender bite. I’ve never tried making shortbread by hand; thanks for the tip. I’ll try it, and also try it with this recipe. (And please let us know if you try the portugal cakes using either method!) I’m very curious to see if there’s a noticeable difference in taste/texture. Regarding “seatel”, while “settle” is probably the right modern spelling, in context I’d take it to mean something more like “sift”. Note that the flour must be “well dryed” and the loaf sugar needs to be “beat fine”. Given the likely conditions of 18th century ingredients, I would expect some form of sifting to be necessary just to get rid of lumps. I think that the reading here should be ‘searce’ which means to sieve through a searce (a sieve or strainer). What is really interesting is that this recipe is very similar to the one in Margaret Baker’s cookbook (British Library MS 2485) on 23r for To Make Protugale Cakes. Baker’s cookbook is a bit earlier, from 1672. It would be interesting to know if they are both drawing on a published source. You’re absolutely right! Looking over the transcription again, I agree that it should be “searce” rather than “seatel” and I’ve corrected this in the post. Portugal Cakes appear in so many manuscripts. I hope when projects like the Folger’s Early Modern Manuscripts Online are completed it will be easier to search and compare print and manuscript resources. I’ve written about this a little bit in my “Lemmon Cakes” post. Thank you for pointing out this Margaret Baker manuscript as well. I’ve written about a Folger manuscript by a Margaret Baker (see tags) and I wonder if there’s any connection. This is a very interesting project! I will look forward to seeing more recipes. Except for treacle and molasses (and to some extent brown- but that’s another story) sugar comes in loaves which have to be broken down into smaller pieces. These pieces would then be processed further into powdered sugar (our granulated) and then double powdered (our confectionary) sugar. Depending upon where they came from and where they were processed they could be fairly clean or full of debits, pure white or grey. Flour would also have chaff and other bits of debits, as a better bolting system didn’t arrive until almost the second quarter of the 19th century. Many recipes routinely tell you to sift the sugar and the flour to get out limps and trash. This is something that modern folks take for granted and no longer have to do. Creaming butter with your hands is done for many reasons. Though most modern people think period kitchens are warm places, they are generally not (I’m not talking about huge roasting kitchens or midsummer, they are again, another story). Most hearths are designed so that the heat goes up the flue, not out into a room. They are large, not shallow like fireplaces inside bedchambers. The heat of one’s hand then helps soften the butter. You can also feel if the sugar has been fully incorporated and allows air to be beaten into the batter. Now, let’s tie all three of these together under the modern idea of consistency. Modern folks expect that every loaf of Wonder bread look and taste the same, no matter what part of the country, or let’s jump even further, what part of the world you are in. Think of visiting France and stopping in a McDonalds. Don’t you want your Big Mac to taste the same as they way it does in Utah? It wasn’t until very recently that any food products became consistent. What I’m trying to say in a nutshell is that food products in the past are not consistent. What has to be consistent is the way the cook deals with them. Ever wonder why some of the recipes tell you to wash your butter? Because it’s been preserved, but from where? Your own cows and stored for winter? Ireland? England? New York? Each of these will taste and feel differently. Some are sweeter, some saltier, they could even be adulterated. Where did your wheat come from? New Jersey? Virginia? That makes a big difference to what you are doing. Wheat from the north is different from wheat from the south. So by mixing with your hand you can feel for the inconsistencies, feel for lumps, and make adjustments accordingly. So where does one find (or how does one make) flower water? I purchase flower waters at my local grocery, which carries a number of ethnic food items. Failing that, I believe Amazon carries them.